Hello Loves. 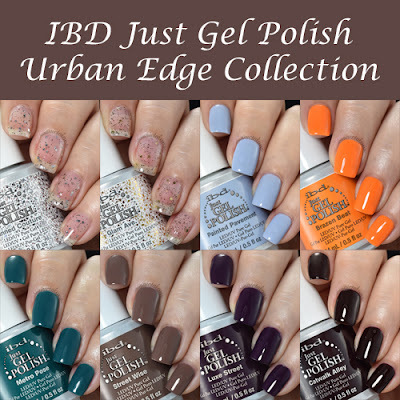 I finally have the IBD Just Gel Polish Urban Edge Collection to show you. I was hoping to get these up earlier this week, but two of the colors were on back order. They came in just as I was going to post without them, so I decided to wait a little longer. The Urban Edge Collection consists of 6 creams and 2 glitters toppers. I wasn't really expecting to like this collection based on the preview pictures, but as I was swatching them I found I actually do like a lot of the colors. Ready to see them? First up is Painted Pavement. This color seems to be the hardest to find. It is on back order through many channels, but it should be popping up soon. Painted Pavement is a soft, pastel periwinkle that leans a little blue. Application was smooth but I did find that I needed three coats for full coverage. The next shade is one of my favorites of the collection. Brazen Beat is a true orange that would have been perfect for Halloween. It leans a little bright but I am thrilled that it doesn't lean pink or yellow like many orange polishes. Sadly, this one was a little streaky for me even after three coats. It may have needed a better shake. Ah yes...the color I hate to love. 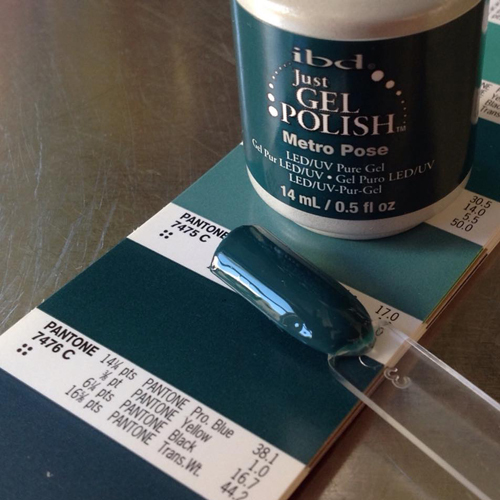 Metro Pose is a gorgeous dark teal. It leans very green in person. I didn't have time to fight with it, so it appears blue in these photos. The formula is fantastic and I found it offers perfect coverage in two coats. Street wise is a nice hazelnut brown cream. It is a little warmer in person than it appears on my monitor. Application was similar to Metro Pose - opaque in two and creamy as can be. I'm sure it comes as no surprise that Luxe Street is another of my favorites from this collection. This deep, vampy purple is yet another with a flawless formula. Two coats for perfect coverage. Catwalk Alley was a tricky little devil to photograph. It wants to appear black in photos, but in person it is a deep, dark maroon. In daylight, the maroon is much more obvious, but it is still a true vamp. Ready to see the glitters? Before we get to the descriptions, I have to say that I am increasingly frustrated by IBD glitter polishes. The base is too thin to keep the glitter suspended, so they tend to be a pain to apply. I had to do some major glitter placement with both of these. The smaller dark glitter pieces wanted to cluster and clump together and the larger pieces wanted to stick to the brush. It's just not worth fighting with them in my opinion. Shame...they are pretty combinations and would be great if the formula wasn't such a pain. Canned Couture consists of large silver hexes, dark silver micro glitters, and silver holographic shimmer. I couldn't capture the shimmer to save my life, but I promise it is there. This is two coats after a good shake. You can see the holographic shimmer a little in this photo of Canned Couture layered over Street Wise. This is one coat after leaving the bottle upside down for a bit. The Urban Edge Collection can be found at your favorite distributor. I also found 7 of the colors on Amazon here. What do you think? I wasn't very excited about this collection at first, but I was pleasantly surprised when I got them in my hands! *This post uses Amazon Affiliate Links. Purchases through those links generate commissions that help fund this site. Thanks a lot for these swatches! One question, how does "Street wise" compare to Le Chat's "Hazelwood"?